Are you too busy to purchase items from the grocery? Do you always find it hard to shop for groceries because of limited transportation? Perhaps you lack the energy to do extensive shopping in your old age? Whatever the case, turn to JustNTime Mobile Grocery Service in Houston, TX. Our mobile grocery offers a myriad of items to keep your fridge well-stocked all year round. Take advantage of our online grocery shopping options today! Why Use JustNTime Mobile Grocery? JustNTime Mobile Grocery has become a leader in the grocery delivery arena. Their customer base continues to grow due to the wide selection of foods offered, great customer service and prompt delivery service. Order before noon and JustNTime Mobile Grocery will deliver the same day! Click on the Food List & Pricing tab above, select your groceries and call 346-715-7519 for prompt, professional service. JustNTime Mobile Grocery services Houston and surrounding areas. JustNTime Mobile Grocery offers a variety of grocery items designed to fit any budget or situation. Whether you need groceries in a day or week, JustNTime Mobile Grocery will do its best to deliver within a business day. JustNTime Mobile Grocery is one of Houston’s most reliable grocery delivery services. It’s fast and easy! Dial 346-715-7519 and begin your great shopping experience today! Sheila Manuel, owner and operator of JustNTime Mobile Grocery, knows the importance of providing quality, accessible food products. Sheila is grateful to be able to provide their customers with quality food and the convenience of shopping from home. 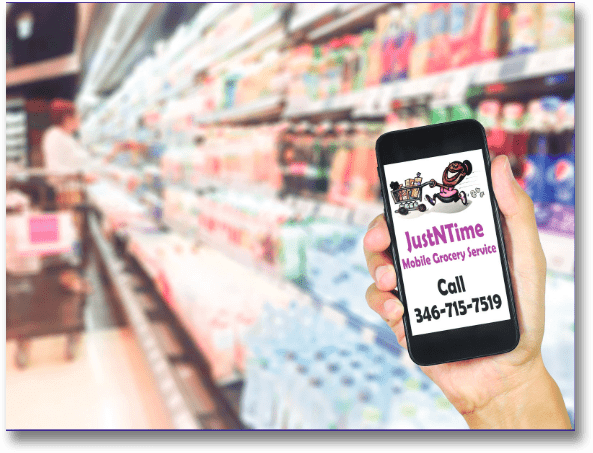 JustNTime Mobile Grocery offers customers a valuable grocery shopping option that ensures their families receive good nutrition. JustNTime Mobile Grocery appreciates the opportunity to serve you and thanks you for your business. Restock your kitchen without the hassle of leaving your house! Trust none other than JustNTime Mobile Grocery Service to provide you with all the grocery items you need. Order from our store today and expect prompt delivery services. To learn more about our store, pricelist, and the online grocery shopping solutions we can offer you, feel free to give us a call or send us an email. We are more than happy to help you with your grocery concerns.